The Battle Gear 4 continues the popular series of car racing games, allowing racing enthusiasts to race against the computer, against the clock or head to head against other players. This popular network racing game creates the sounds of racing with Dolby Digital 5.1 support. Battle Gear 4 is a game of skill, a driving simulator whereby players race street legal cars on narrow Japanese speedways. The focus of Battle Gear 4 is on manual shifting, drifting and semi-legal driving tactics. Players get to select from four different classes, with each class having a car from a different world class manufacturer. When players are viewing the cars all the technical specs like weight and RPM are listed. There are over seven racing courses to choose from with a variety of landscapes and conditions that include the seaside to the city and night and day, with a great overview of each course available to each player. There is also the opportunity to earn money as you win races along the way. 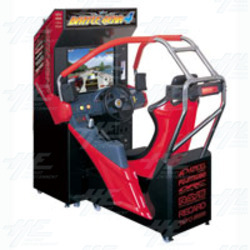 The Battle Gear 4 continues the popular series of car racing games, allowing racing enthusiasts to race against the computer, against the clock or head to head against other players. This popular network racing game creates the sounds of racing with Dolby Digital 5.1 support. Battle Gear 4 is a game of skill, a driving simulator whereby players race street legal cars on narrow Japanese speedways. The focus of Battle Gear 4 is on manual shifting, drifting and semi-legal driving tactics. Players get to select from four different classes, with each class having a car from a different world class manufacturer. When players are viewing the cars all the technical specs like weight and RPM are listed. There are over seven racing courses to choose from with a variety of landscapes and conditions that include the seaside to the city and night and day, with a great overview of each course available to each player. There is also the opportunity to earn money as you win races along the way.